St. Gundekar-Werk GmbH—a housing and urban development organization affiliated with the Catholic church—has committed itself to offering housing for a diverse clientele of tenants at affordable prices. 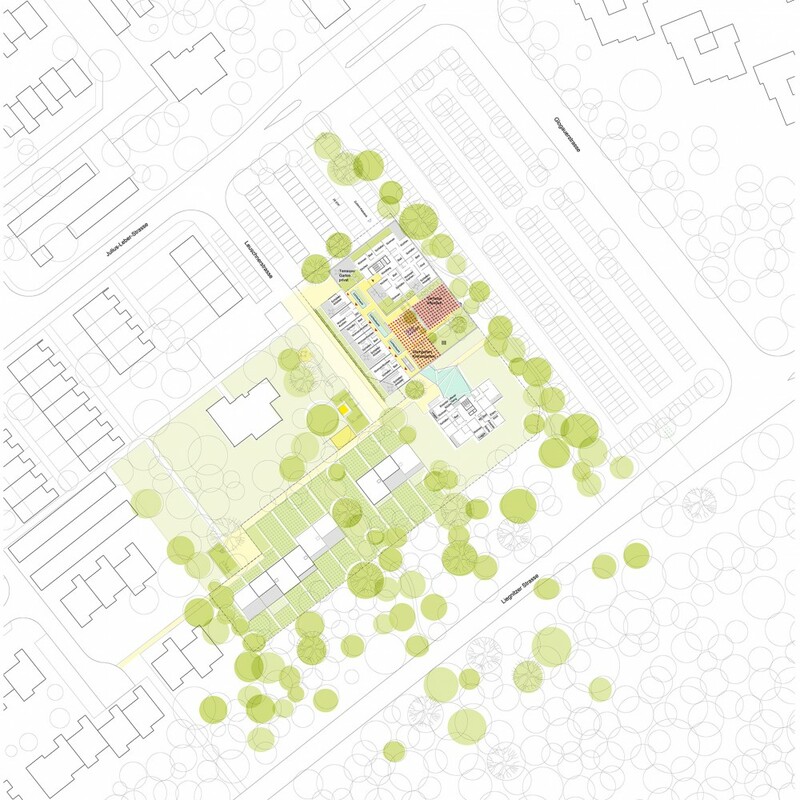 In addition to goals such as energy efficiency, maximum exploitation of daylight, and the use of long-lasting construction material, in this case wood, sustainable housing projects should also be designed for social success, meet the safety and security needs of its inhabitants, facilitate good neighborhood, and be absent of barriers. 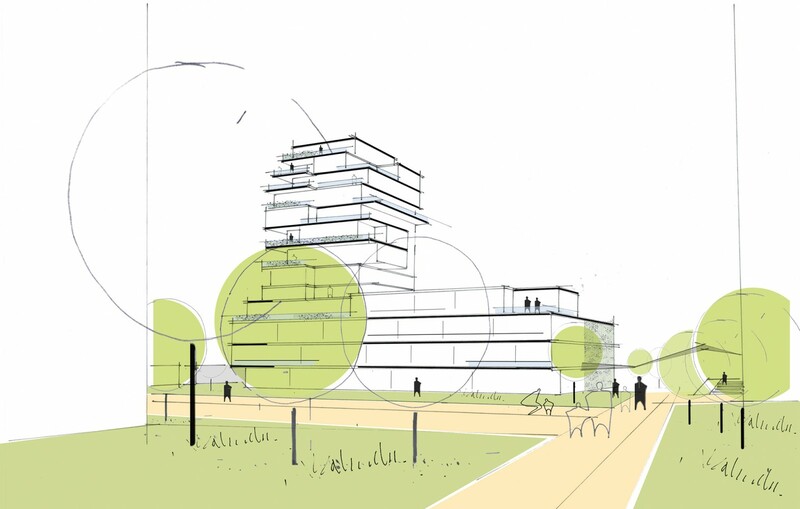 The expansion of the existing residential tower of the St. Gundekar-Werk in the Leuschnerstrasse in the Nuremberg district Langwasser-Süd will create high-quality residential space, improve the social mix, and upgrade the public space. 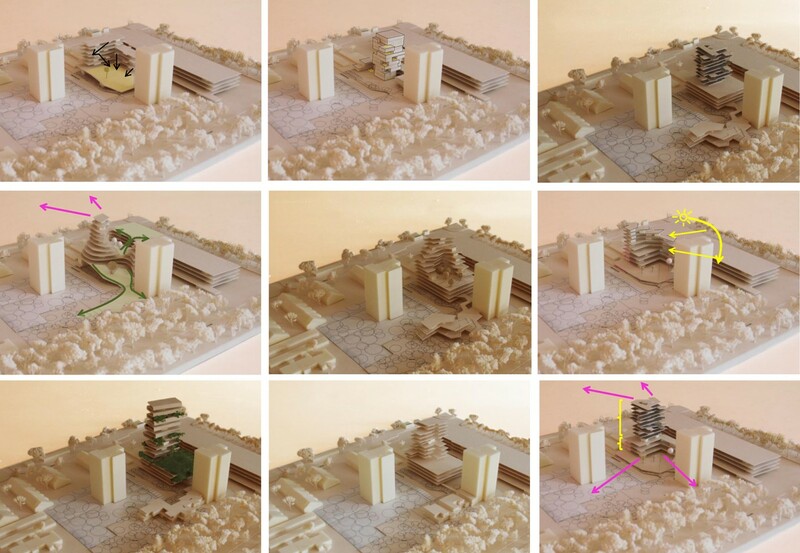 The new measures take their cue from the existing urban situation, which features a structure that breaks down into several smaller units still shows rudimentary traces of the masterplan of 1955. The objective is to upgrade the public space and existing playing and free areas there and also to improve the parking situation. Public plazas and green areas provide attractive exterior spaces for the residents of the tower where they can while away time or meet. One of the existing residential islands will be re-structured to achieve a better social mix in the new housing area which will comprise a boarding house, town houses, and social housing. 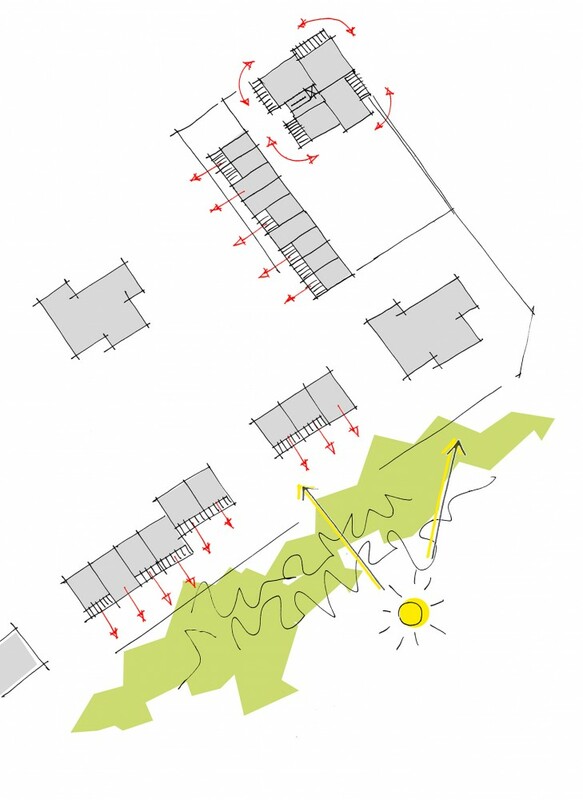 A new four-story naturally-ventilated carpark creates an architecturally defined space for the storage of cars, enables the creation of a residential, traffic-calmed “play”-street, promoting the idea of comprehensive sustainability. The carpark serves as a link between the new and the existing buildings and provides a generous, covered, and barrier-free entrance setting. 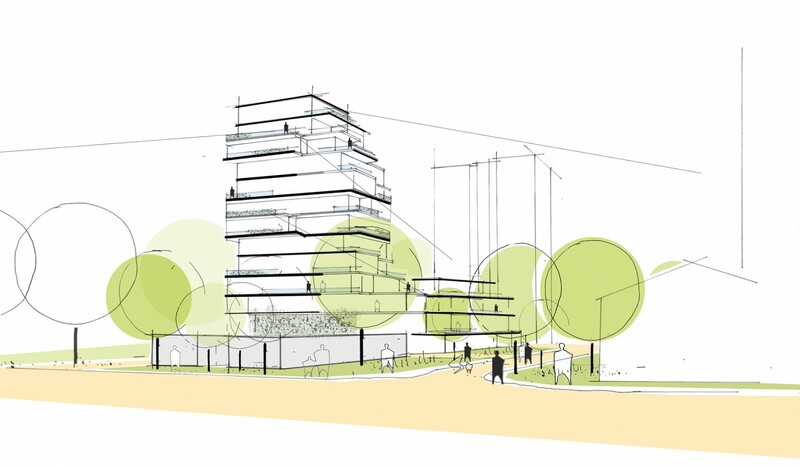 The residential tower grows out of the planted green carpark and features a semi-public terrace on the roof which is available to the community. The terrace intermeshes with the existing tower and forms the link to the new building. All apartments face two directions, thereby offering optimal lighting conditions and different views. The apartments in the north have views to Nuremberg and, in addition, are either east- or west-facing. The boarding house has been integrated into the carpark along the Leuschnerstrasse. The intention is to offer it for temporary usages, such as for the Nuremberg Exhibition Center. 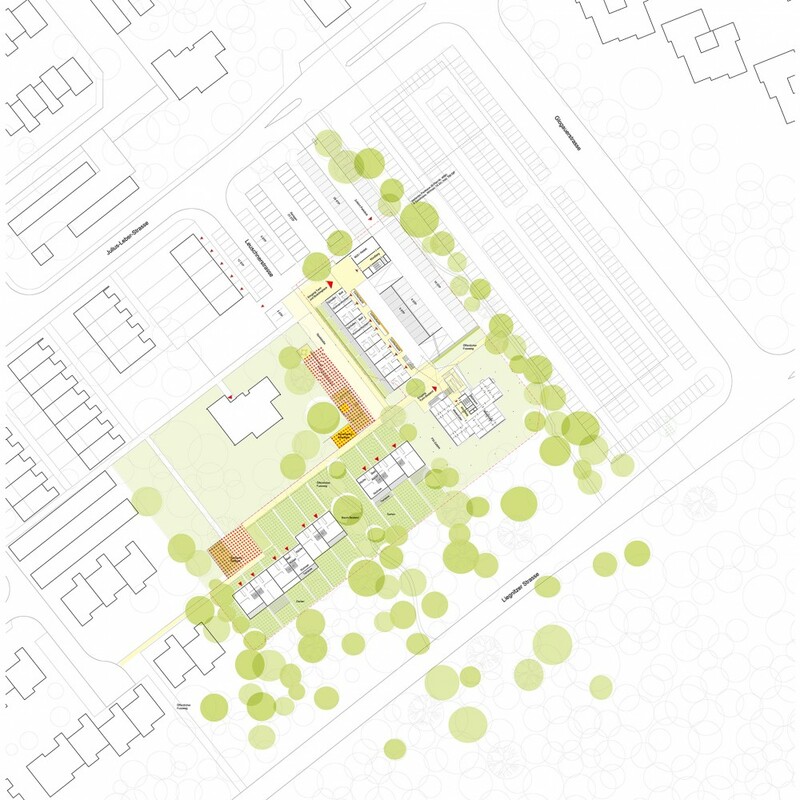 A third user unit will be the town houses which are planned in the south west of the existing site. Respecting the existing structure these will follow detached homes already standing here and be built to low height in order not to cast shadows on the residential tower of the Evangelisches Siedlungswerk on its key orientation facades. The special feature of the Nuremberg Langwasser high-rise is its construction as a multistory wooden building. It has continuous supports throughout all levels to transfer the loads directly into the ground with as few intermediate layers as possible. The concrete layer of the wood-concrete composite ceiling plates serve both as bracing and as a fire barrier to improve compartmentation of the different stories. Furthermore, it does not have the usual reinforced concrete core (e.g., in the form of a stairwell) to serve as bracing but instead makes use of the wooden ceiling plates for this purpose. 15.919 qm / 171.288 sq.ft. 55.700 cbm / 1.967.045 cu.ft.